NOTE: The photos accompanying this review are taken from various internet sources and do not represent the quality of the Blu-ray under review. 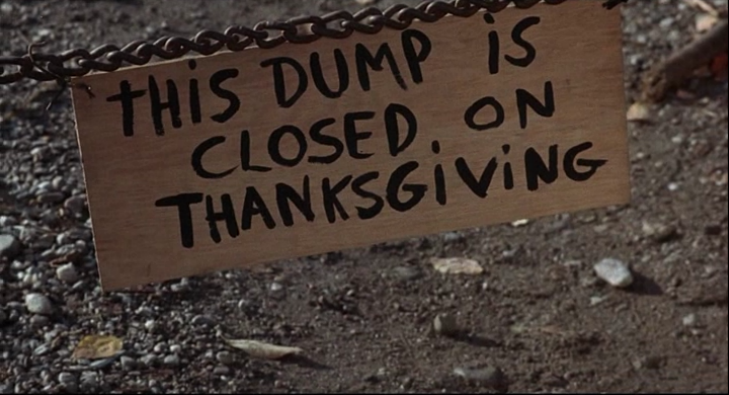 The 1967 folk song "The Alice's Restaurant Massacree" is essentially a shaggy-dog story set to ragtime guitar, in which singer-songwriter Arlo Guthrie recounts his run-in with small-town law over illegally dumping a bunch of post-Thanksgiving-feast garbage, and how that legal entanglement essentially saved him from being drafted into the Vietnam War. It's an activist message snuck in through a broadly caricatured comic story-song. When Bonnie and Clyde director Arthur Penn decided to turn the song into a film with co-writer Venable Herndon, the puzzle was how to stretch that musical monologue out to a feature-length movie. Even though the song runs a good 18+ minutes, that still leaves you with another hour-and-a-half or so to fill. Penn stated in an interview that many concepts were batted around, including a Rashomon-like take on the story, where the events were re-told from the perspectives of the different people involved. This still seemed a little thin, so Penn and Herndon instead decided to make the monologue the centerpiece of a slice-of-life drama about the counterculture from which the song sprung. They incorporate elements from Guthrie's biography, but also construct many incidents to frame the events in a way that paints a portrait of a lifestyle in decline. As DVD Savant observed in his new review of the movie, the movie of Alice's Restaurant is much more of a downer than one would expect, considering that the source material is essentially a satirical novelty record. Scared of the draft, Arlo Guthrie (playing himself) decides that college out in Montana is the best bet for staying out of the war. Unfortunately, he bristles against the strictness of his instructors and finds himself subjected to ridicule and violence by the townies for his long-haired appearance, so he hitches his way back to the East Coast. 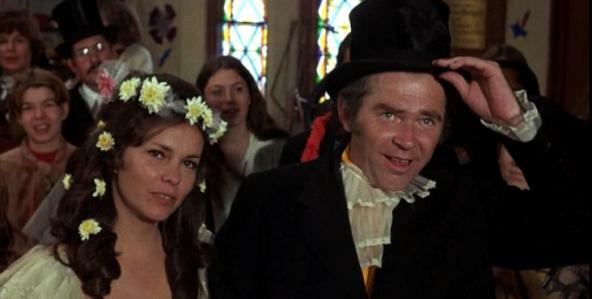 He hooks up with old friends Alice and Ray Brock (Pat Quinn and James Broderick), who are busy turning a deconsecrated Massachusetts church into a communal crash pad for all their boho friends. Arlo travels back and forth from the church to New York City, where he tries to get some paying folk club gigs and visit his parents (played by Joseph Boley and Sylvia Davis) before his dad Woody totally succumbs to Huntington's disease. (In one charming scene, family friend Pete Seeger [as himself] plays some songs with Arlo to cheer Woody up.) Alice and Ray have trouble keeping their marriage together, let alone a commune. Ray likes to race motorcycles and get a little too mad when he's drunk; Alice likes to cook and seek comfort in the arms of other men, like heroin-addicted racer Shelley (Michael McClanathan). Despite the extremity of a lot of the events in the film, director Penn steers it far away from melodrama by keep everything mostly low-key and realistic. After more than an hour, the film final provides a visualization of Guthrie's "Massacree" monologue. In both good ways and bad, this 15-20 minute chunk feels like it dropped in from another film. It successfully lightens the mood at a point where the film was becoming almost oppressively bummed-out, by giving into the cartoonishly subjective elements of Guthrie's storytelling. Arlo and his buddy Roger (Geoff Outlaw) are arrested for dumping garbage and forced to watch a bunch of Keystone Kops scramble all over the garbage, taking pictures and samples of the crime scene. Then, when they arrive in court, the judge is blind and can't see that evidence anyway. (In a nice touch, the real-life arresting officer and judge play themselves.) Later, when Arlo is forced to be poked and prodded and questioned by the draft board, it's a bureaucratic nightmare out of Terry Gilliam's Brazil. M. Emmet Walsh makes a fun early-career appearance in this section as an incomprehensible sergeant, who asks Guthrie if he has been "rehabilitated" from his criminal past. And then, as abruptly as it arrived, the "Massacree" section is over and the film delivers its third-act emotional bombshells, shifting the comedy-drama pendulum all the way over into humorless drama. As interesting as Penn's thoughtful dissection of middle-class social dropouts is, one can't help wishing that someone like Hal Ashby or young Brian De Palma had been given the job of cooking up an adaptation of this song, because they might have tried to tackle these issues while maintaining Guthrie's satirical voice throughout. As it is, Penn's film is more admirable than entertaining. I'm glad I watched it, but I doubt I'll revisit anything besides the "Massacree" section and some of the great in-character musical performances. The AVC-encoded 1080p 1.85:1 transfer is a little extra-grainy in sections and occasionally marked with dirt and scratches but, for the most part, it is surprisingly crisp and clear for a less-than-major catalog title like this. Colors are strong and black levels are rich. Very satisfying. No complaints about the DTS-HD MA 2.0 mono audio mix. Speaking voices come through unmuffled, and musical performances are clear as a bell. A scene at a motorcycle racetrack comes through quite powerfully. No subtitles. Just a trailer, which sells the movie as a comedy -- which it's not really. I first saw this movie on VHS in high school, shortly after I had heard Arlo Guthrie's signature song for the first time. I didn't like it, largely because I think I went into the movie expecting some kind of hippie comedy. Now, watching it fifteen years later, my expectations were properly adjusted for a freeform drama with moments of comedy and music, and I found a lot to like in it. In the very least, its emotional honesty makes it a unique product of its time. Recommended.